Double glazed door and full height matching side panels to front, large double glazed windows to sides, smooth plastered and coved ceiling with inset lights and ceiling point, smooth plastered walls all painted in neutral colours, feature architrave to door frames, feature recessed shelves, neutral coloured carpet, radiator, various power points, double doors to cloaks storage cupboard. Hallway winds through to remaining rooms. Triple aspect with double glazed windows to front, side and double glazed sliding patio doors to rear, all windows and doors offer extensive garden and rural views with this room having a lovely sunny aspect. Smooth plastered and coved ceiling, smooth plastered walls all painted in neutral colours, feature shaped stone fireplace with matching hearth, dual-fuel burner (log and coal), various radiators, television point, wall light points, various power points, neutral coloured carpet. Double glazed window offering extensive rural views over gardens and beyond, further double glazed window to front, smooth plastered ceiling, ceiling light points, feature panelled walls in neutral colours with hidden storage area, neutral coloured carpet, various power points. This room is divided into two areas with dining area and office/reception. Double glazed window and door offering extensive garden and rural views, smooth plastered ceiling with inset lights, smooth plastered walls, range of fitted units at both base and eye level incorporating internally illuminated glass-fronted display shelving, feature tiling between base and wall units, inset induction hob with lighting above, built-in Bosch double oven at eye level with built-in microwave below, roll top worksurfaces, one and a half bowl stainless steel sink unit with chrome mixer tap, integrated fridge, integrated dishwasher, boiler serving hot water and central heating systems, designer tiling to floors. Double opening doors with feature stained glass and leaded inserts, double glazed window to front, textured ceiling, plastered walls, space and plumbing for two domestic appliances, shelving and power points. 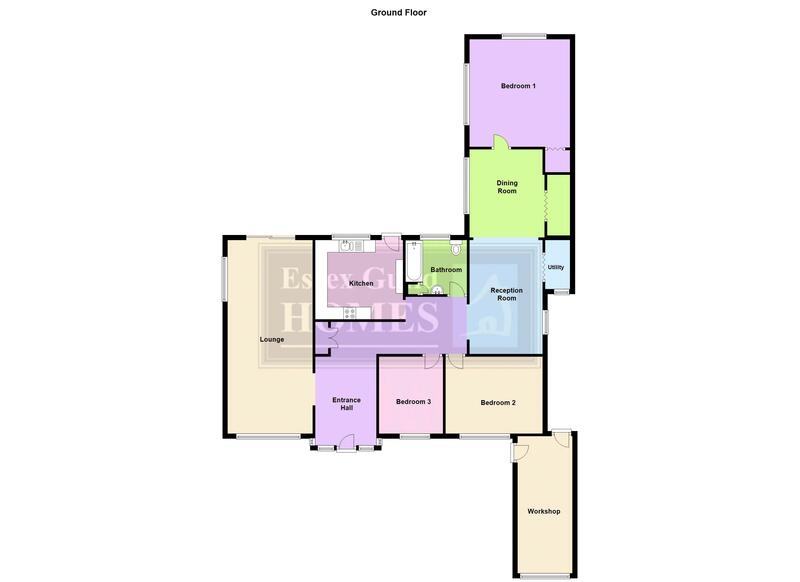 Dual aspect, double glazed window to side and full height windows to rear, all offering extensive garden and rural views, smooth plastered and coved ceiling, smooth plastered walls, built-in wardrobes, radiator, various power points, television point, neutral coloured carpet. White double glazed window to front, textured and coved ceiling, ceiling light point, smooth plastered walls, radiator, various power points, neutral coloured carpet. Double glazed window to front, textured and coved ceiling, smooth plastered walls, built-in wardrobes, radiator, various power points, neutral coloured carpet. Double glazed window with opaque inserts to rear, smooth plastered ceiling with inset lights, fully-tiled room in light neutral colours with decorative border and two large inset mirrors, double width sink unit with storage area below, panelled bath with mixer tap and separate electric shower above, dual flush low level wc, radiator, complementing floor tiles. Commences with paved stone patio area which extends to side with dwarf brick wall and matching planters. The garden offers extensive rural views and the Seller tells us that deer have been spotted in this area in addition to other wildlife, steps lead down to further patio area measuring 20 ft x 12 ft again with brick built planters. Then steps down to main lawn area with well established beds, borders and rockery and an abundance of shrubs bushes and trees through the grounds with various fruiting trees. Superb, Large purpose built high vaulted pergola with roof offering covered seating area with decked base extending outwards into the grounds. Hard standing to far corner with shed and greenhouse. This hugely versatile tranquil garden offers many seating, playing, vegetable growing, sunbathing and open space for lots of other uses with a good mix of sunny and shaded areas. Large frontage with In and out driveway allowing parking for multiple vehicles, oak tree to front with shaped lawn below. Outside lighting. Doorway to side gives access to workshop with double glazed window to front, power and lighting connected. This room is currently used as a workshop but could be reinstated as a Garage if required.